How Do I Get Rid of Crabgrass? Crabgrass was brought to the U.S. in 1849 with the good intention of being a crop that would potentially feed livestock. That plan fell through, so we are now stuck with the pesky plant. 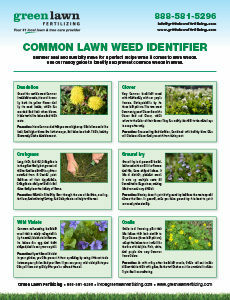 Weeds hate competition, so your first plan of attack to get rid of crabgrass should be to get your grass healthy. Crabgrass thrives in warm, dry conditions. 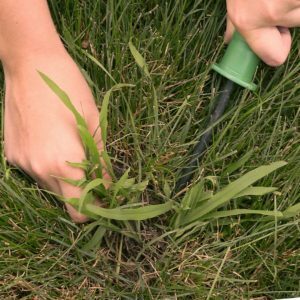 Watering your lawn too lightly over the summer can also leave your grasses’ deeper roots dry while watering the shallower roots of weeds like crabgrass only. The best way to combat a potential watering problem is to water for longer, less frequently. 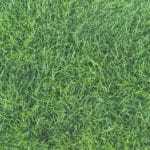 Grass roots go deep into the ground and take up a lot of space, so by taking away those empty spots on your lawn, crabgrass doesn’t have the opportunity to thrive. 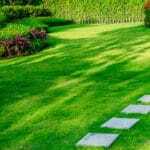 Let grass grow long enough to create shade at ground level and keep moisture in the soil. And be sure to check your mower; if your mower’s blade isn’t sharp, you hurt your grass every time you cut it. Grass that is harmed by a dull blade grows more slowly, giving crabgrass the opportunity to thrive. 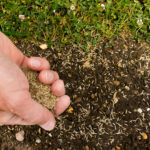 Soil compaction keeps air and water from reaching the deeper levels of soil where grass roots grow, so that only plants like weeds—which tend to grow nearer to the surface—can thrive. Aerating the soil and reseeding your lawn combats the crabgrass-friendly conditions caused by soil compaction. If your soil’s pH level is too high or too low, your grass is not getting the nutrients it needs to be strong enough to crowd out weeds like crabgrass. To balance the pH level, your soil may also need applications of lime. 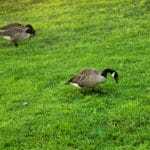 Bring in The Professionals to Get Rid of Crabgrass. Contact the professionals at Green Lawn Fertilizing to get pesky weeds out of your yard and help get your lawn in tip-top shape. We have the applications and proper ongoing fertilizing treatments to keep crabgrass gone for good. Call us today at 888-581-5296.